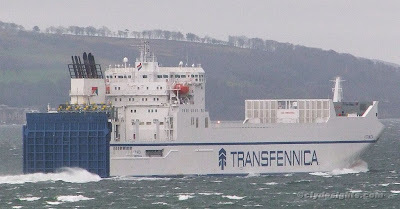 Making light work of the stiff southerly wind as she sailed downfirth this afternoon, Spliethoff's ro-ro freighter TIMCA was heading from Europe across the North Atlantic, her first scheduled discharge port being Baltimore. She and her sister GENCA appear to have displaced the earlier 'S' class Spliethoff ships on the service from Greenock carrying paper reels. These vessels were originally designed to operate on short-sea routes in the Baltic and North Sea.